Release for new Fokker E.V model kit 1/72 scale is very close. As usual modelers are very excited with colour schemes included in kit box. Let’s see what is prepared for this kit! Expert Set is prepared for advanced modelers. It’s content includes not only plastic parts, but also photoetched sheet with details and two big decals with Lozenge patterns and insignias printed by Italian Cartograf. Fokker E.V 187/18 „001” 7. Aviation Squadron. Lwów-Lewandówka Airbase, April 1919. Airplane delivered from Warsaw, before the painting of a personal insignia. The airplane freshly delivered from Warsaw after overhaul in Mokotów-Field Central Aviation Workshops in, with typical for the workshops painting scheme with the white tail. 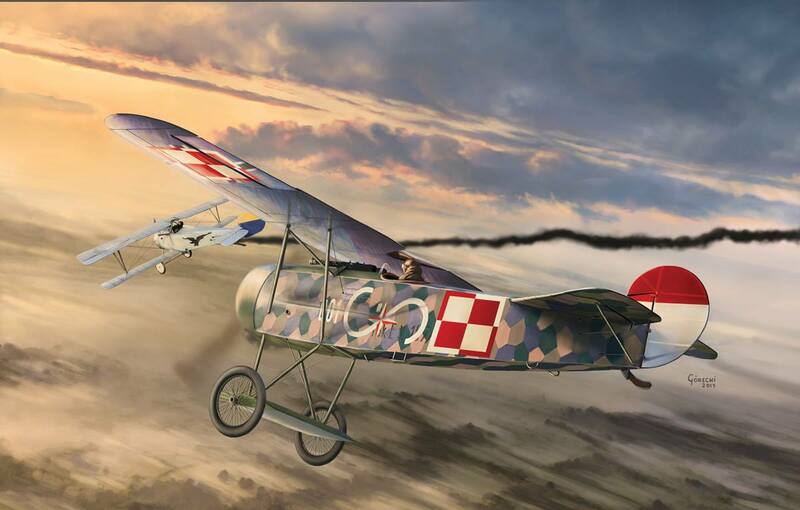 The airplane repainted in Lwów in traditional white-and-red tail scheme from the period before introduction of the white-and-red checkerboard. Original “Warsaw” “001” number probably covered by the lozenge fabric patch. White “S” has already been Stefan Stec’s personal marking during the Great War fights over the Italian Front. Markings of aeroplane Stec flew in air combat with Ukrainian Nieuport piloted by Austrian ACE Franz Rudorfer on 29th April 1919 over Lwów. Jasta 6 of the elite Jagdruppe I called Richthoffen’s Flying Circus was the first squadron equipped with the Fokker E.V airplanes. The first “Razors” came to the unit on 5. August 1918 and soon almost whole Jasta has been equipped with the new type. The airframes were marked with white-and-black stripes on the tail and wheels and characteristic black star on the white engine cover. Individual markings were white or white-and-black figures like arrows, stripes, lightings etc. Two pilots shared the black-and-white checkerboard-marked airplane: Lt. Wolff called “Wolff III” (there were two other famous pilots with that surname in the Gruppe: Richthoffen’s friend Kurt Wolff and Hans Joachim Wolff) and Gefr. Kurt Blümener. One of the Fokker E.V equipped squadrons was the Jasta 36, earlier using the blue-marked Dr.I triplanes. The aircraft with the (most probably) red star is known from the two photographs, where the shade of the star is clearly different than the cross’ black and blue engine cowling. The tail may have been left in lozenge or painted in blue colour as a unit marking. Junior Set is prepaeed not only for begginers, but also for expereinced modelers looking for quick built one. It contents plastic parts and decals by Techmod. Leutnant zur See Gotthard Sachsenberg, former schoolmate of the legend of the whole German fighter aviation, famous Oswald Boelcke, was in February 1917 the creator and commander of the Marine Feld Jasta (MFJ I – first Navy Field Fighter Squadron). Unit’s duty was defence of the Belgian harbours actively used as Kriegsmarine u-boat bases. In following months more squadrons were created, in June 1918 followed by the three-squadron Marine Jagdgruppe (Naval Fighter Group), commanded by Sachsenberg, who remained also the commander of the MFJ I. All the naval Gruppe fighters were marked with yellow, while the Staffeln were distinguished by the number of the black stripes on the elevators: MFJ I had one, MFJ II had two, and MFJ III – three. Since 10. April Marine Jastas were receiving the new Fokkers E.V and one of them, probably 160/18, has been assigned to the Gruppe commander, Sachsenberg. The aircraft has soon been painted with his personal marking – black-and-yellow checkerboard. Naval Fokkers took active part in fights over the front but the order grounding the type after the wing failures soon ceased their activity. Sachsenberg liked the Fokker E.V very much so he has chosen this type also after the War, during fights against Bolshevik in Latvia. The airplane was used 1922-1926 in Aviation Maintenance School in Poznań/Ławica. In 1924 was part of the aviation exhibition during the Poznań Fair on the roof of the Aviation Hall. In September 1926 has been presented with renovated Friedrichshafen G.III bomber.